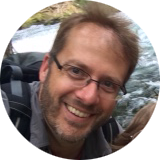 interpretation – Tour Guide Mark – Let's Go Exploring! As a nonprofit marketer, you are focused on outreach, communications, engagement, and development activities. These actions are often intertwined through the products you produce: fundraising emails, education events, social activities, printed communications, signage etc. But, what binds all of this together in the mind of your audience? Is there a way to strengthen this messaging with emotional and intellectual connections? How do you make your organization’s message meaningful? This can be accomplished with the help of a discipline called interpretation. Those who practice interpretation are “involved in the interpretation of natural and cultural heritage resources in settings such as parks, zoos, museums, nature centers, aquaria, botanical gardens, and historical sites.” Reference: National Association for Interpretation. Marketing is about helping your audience to succeed in what they want to do and nurturing them so that when they are ready they think of your organization. So, how can marketing be strengthened with interpretation? Here are six of the original principles of interpretation developed by Freeman Tilden (shown above). To give these a more modern presence I have used the principles as stated in Beck and Cables,’ Interpretation for the 21st Century. Below the principles are my own observations about marketing. Also, I am using a general definition of “product” to be anything you might produce within your nonprofit, this could include: fundraising activities, events, social activities, communications, and signage, even items sold in your store etc. Principle 1: To spark an interest, interpreters must relate the subject to the lives of the people in their audience. Do the benefits of the product support personal discovery or a discovery situation? Does the product allow the visitor to succeed by gaining new insights / or see previously known information in new ways? Does the product relate to the experiences of the park visitor? Principle 2: The purpose of interpretation goes beyond providing information to reveal deeper meaning and truth. Does the product provide a quality opportunity for the visitor to support your organization’s programs? Does the product support a connection between the tangible and intangible elements of an interpretive site? Does the product reinforce information about the site in meaningful ways? Principle 3: The interpretive presentation–as a work of art– should be designed as a story that informs, entertains and enlightens. Can the product be localized with interpretive text, or customized to creatively support a park theme? Is the product compelling as well as providing a vehicle for park themes? Is the product in context with the site or program themes? Principle 4: The purpose of the interpretive story is to inspire and to provoke people to broaden their horizons. Does the product support awareness, understanding, or enthusiasm for the resource (your organization, local green space, etc)? Can the product be used to make information meaningful? Can the product support a behavioral change or reinforce existing behavior? Does the product allow for experiential learning? Principle 5: Interpretation should present a complete theme or thesis and address the whole person. Is the product an extension of the unifying park or program theme? Was the product produced with materials, or methods that support park themes? Does the product activate the senses? Does the product relate the visitor to current or future park activities? Does the product meet tangible needs, emotional needs or transformational needs of visitors? Principle 6: Interpretation for children, teenagers, and seniors-when these comprise uniform groups-should follow fundamentally different approaches. If needed, can the product be tailored to support a specific age group or a range of age groups? To learn more about Interpretation visit the National Association for Interpretation online, www.interpnet.com. The image of Tilden is sourced from the National Park Service. GlyphGuy Backpacks was about children connecting with nature. Created by Mark Hougardy this garage-based company produced over 10,000 backpacks between 2002 to 2012. A quarter of this number directly supported the National Park Service’s Junior Ranger program. Half of the total number helped nature centers and the US Forest Service with solidly-made backpacks for their outreach and education services. The remainder were for parents and families. 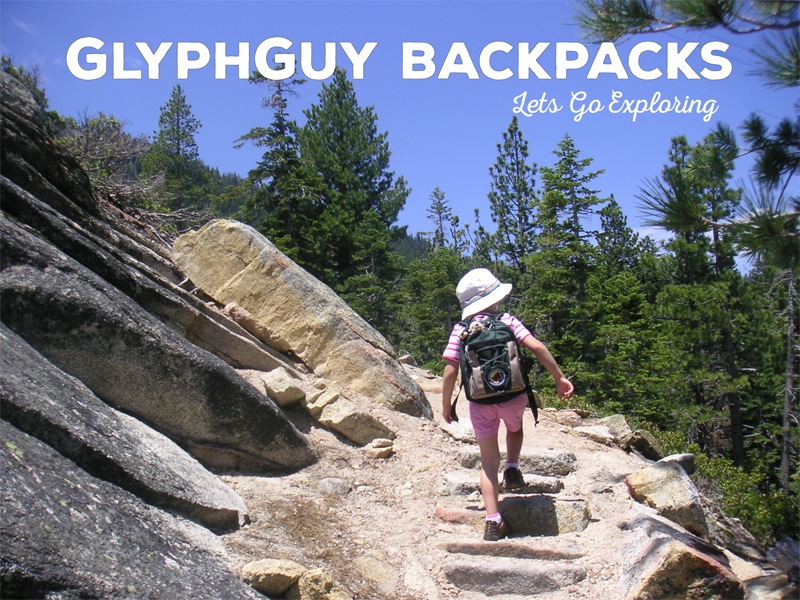 Even though GlyphGuy Backpacks has since walked into the sunset, what is important is that we helped plant seeds with a younger generation about the importance of exploring and conversation. It is my hope that those seeds flourish, and someday, possibly, a few grow to become giants. 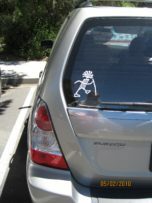 A GlyphGuy Hiker on a Subaru! A shipment of GlyphGuy Backpacks. One of the original prototype “Alpine” models. After ten years it was still going strong. An adventurous three-year-old walking into the green unknown with her GlyphGuy pack. The photo was taken in 2003. Getting ready to get muddy at a freshwater pond. Shown are the “Coyote” and “Chipmunk” pack versions. Tasty! 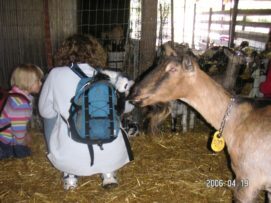 Even our four-legged friends like GlyphGuy Backpacks! Good thing too since GlyphGuy was the ONLY backpack sold by the parks that were FREE of harmful lead, mercury, and phthalates. My daughter enjoys visiting the baby goats. Her teddy bear is in tow safe and secure inside her GlyphGuy Backpack. 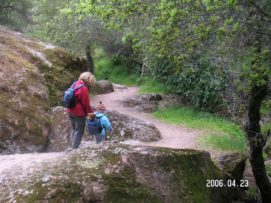 A visit to Pinnacles National Monument (now a National Park). Mom and daughter are seen on the trail. The “Chipmunk” and “Bobcat” pack models are shown. 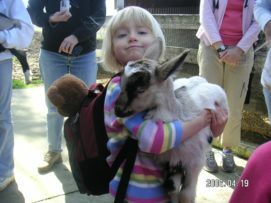 Children loved to carry their teddy bears and, in this case, a teddy cat, in their backpacks while exploring the trail. Giving the “Chipmunk” model at test run at Lake Tahoe. This pack was a prototype for California State Parks’ Junior Ranger program. Clamoring over the base of a redwood tree with a GlyphGuy Backpack. Testing out a new display of Junior Ranger backpacks for California State Parks and the iconic Smokey the Bear. GlyphGuy’s NPS Junior Ranger pack on the back of a young climber. The GlyphGuy booth at one of the park interpretive shows. Hey Mom! Let’s Go Exploring! How Strong Are Your Nonprofit’s Products? A nonprofit should not just sell products… it should market benefits. During a visit to a National Park last summer I overheard a family refer to the products in the park store as ‘weak.’ Looking at the shelves filled with plastic mementos and affixed logo items I knew what they meant, but still, I politely inquired. The family had attempted to find products that were emotionally meaningful instead they found trinkets. Such products did not represent the visit they had just experienced. Over the past several days the family had shared a rare extended weekend together in one of America’s most beautiful locations. During their last hour in the park, they wanted to buy something that helped ‘connect’ them to their enjoyable family experience, but they found nothing that expressed a strong emotional connection. Their final moments in the park would end on a lackluster note. Unfortunately, many park or nature-related stores do not understand why customers buy. Kids do not buy plush animal toys; they buy companionship. People do not buy books; they buy entertainment/knowledge. People do not buy a whistle; they buy safety. People do not buy annual park passes; they buy convenience. People do not buy jackets; they buy warmth. All products in the nature store, or at least every product group, needs to be benefit-assessed. The next step is to determine how these benefits add-up to strengthen the store, extend interpretive programs and benefit customers. A benefit assessment can be classified as weak, medium or strong. Example: Have you ever been to a park concessionaire and seen an entire shelf of whiskey shot glasses? Each is emblazoned with the name of a different park landmark. While a glass might be used for drinking its basic purpose is a single-use item (decoration). Other examples of weak products are postcards, magnets, stickers, posters, t-shirts, and clothing items. Weak benefit products are generally impulse-buy items that do not engage the user beyond the act of purchasing it. Too many weak items in your store (greater than 50% of inventory) do not serve the mission for your organization. Are weak benefit products bad? No, they serve a purpose, but do you want your store to offer only products that offer only a single benefit? You can do better. A targeted question to ask: How could this product help a person to better understand my resource (park, natural area etc.)? How can it help them to be creative? Your job as a marketer is to find how you can differentiate your product (natural area, park, watershed, historical site etc.) within the mind of the customer. You need to provide more products that are medium and strong. The hallmark of a medium strength product is an ability to engage the user and better appreciate the local resource, park, natural area etc. 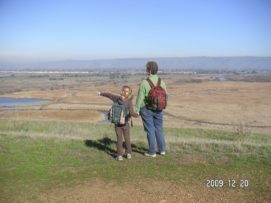 Examples: Regional/park guidebooks, maps, field guides, and items that support interpretive goals like a high-quality backpack (like an old GlyphGuy manufactured backpack) is a strong product. 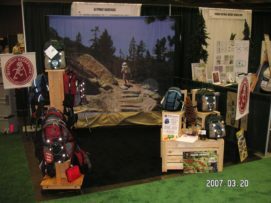 A properly marketed backpack could be utilized in children’s programs, used as a ‘checkout pack’ which allows families to check out backpacks from the nature store to use while exploring the park when they are returned the family is offered a significant discount at the nature store if they choose to purchase one. The sign of a strong product is its ability to alter perceptions and continually helps the user to be creative. Strive for a weak product inventory of 40%, and a combined medium/strong inventory of 60%. Remember, products do not sell themselves, the benefits of the product do. Banana Slugs are really cool. They can be up to 9 inches in length and are recognizable by their bright yellow color. The slugs help to turn old leaves and plants into the soil; they are “good guys” in the forest. It is possible to see several on a day hike, but on this hike in the Point Reyes National Seashore, located in California, my family encountered 55 individuals in just seventy feet of the trail! What a rare treat! Our hike began at the Point Reyes Hostel and continued down a gentle trail to the coast. In a low section, moisture was being funneled off the hill and over the trail into a marshy area. 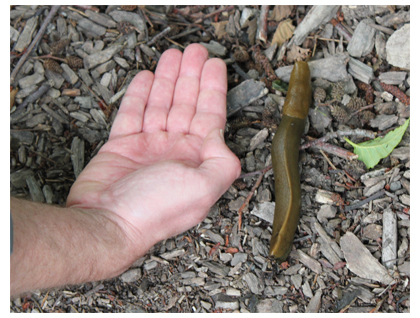 This is when we saw a banana slug, then another and then one about every foot and a half. The slugs were everywhere. Some were fully-grown; others were just a couple of inches in length. Two-thirds of the slugs were pointed basically the same direction, to the moist area just over the trail. I am not sure if this grouping was because of the water, or a food source, but it was a very unusual sight to come across. That afternoon, while returning from the beach, I passed the same area. Now, just a handful of slugs could be seen, the rest has disappeared into the undergrowth. For five years the Sierra State Parks Foundation used Mark Hougardy’s images to help generate income at local park stores. The profits were used to fund larger outreach and interpretive programs. Updated versions of the images are shown. 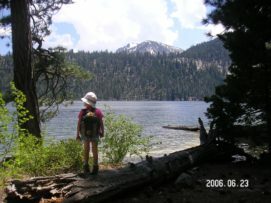 The foundation is the cooperating association for California State Parks in the Lake Tahoe-Donner region. 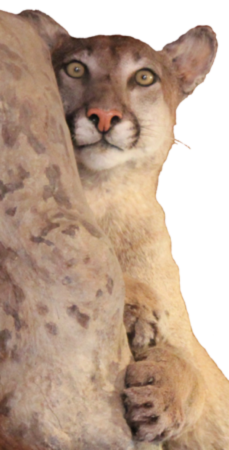 This large cat shares many names: mountain lion, puma, panther, and cougar. Built for stealth and power these majestic creatures have large padded paws, tawny-colored fur, muscular limbs, and sharp claws. They are generally elusive and can be found in remote wooded or rocky areas where the deer populations are prevalent. The photo was taken in Sunol, California, at the Sunol Regional Wilderness Interpretive Barn. Lassen Volcanic National Park is an under-visited companion to other parks in California, however, the beauty does not disappoint. The volcano last erupted in 1915 and the rugged area offers a number of hot springs. Concession user fees are a primary source of funding for the park’s outreach and visitor services. Mark Hougardy’s image was used in park visitors centers from 2004- 2011 and an updated version is being planned. These are some great questions and concerns from park store buyers about pricing Junior Ranger backpacks. We have listed them below so you can read other buyers’ concerns and learn about our responses. The pricing structure in my store is to key-stone all items, your backpacks won’t sell at such a high price. The public is very sensitive to price – especially now in a down economy. Your backpacks are priced too high to sell in this recession. Your backpacks are great. My store sells them for more than your recommended price because they are such good quality. But, they sell slowly, what can I do? My customers will go to an outdoor store to buy a backpack. Customers will not buy anything in my store priced over $25. My store can buy cheaper Junior Ranger backpacks from a park association out west. Those backpacks look just like yours. Why should I go with your backpacks? Note: Key-stoning is when you double the price. A store buys a product for $1 and gives it a 100% markup, selling it for $2. This is an easy pricing model to manage, but not practical for all items – and it does not serve your customers well. You might try offering markup levels for the ‘benefits’ the products offer the customers. The manufacturer knows little or nothing about how their product was made, product testing etc. Medium benefit items generally retail between $5-$20. These products have a mid-range wholesale cost and offer a return of 200% to 300%. These items tend to be more interpretive in function and targeted to the local resource. Made overseas or in U.S. The manufacturer has some knowledge about how their product was made, product testing etc. Made overseas (to U.S. safety guidelines) or in the U.S. The manufacturer has extensive knowledge about product safety etc. Manufacturer provides information or is willing to train your staff about their product. During this Recession, families have suffered great financial losses. Families are obviously concerned about price, but their expectations about pricing and products have transformed. The public now wants “greater insight and accountability, transparency … and assurances for the future” with anything they buy. (The Burton Group, “Dimensions of the New Normal” page 2, Jan. 12, 2010). The outdated 20th century way of doing business was ‘Just making a profit.’ Today, anything you sell in your store must ‘walk-the-talk’ by being safe, environmentally accountable and trustworthy. If not, customers will view your store as just more of the same outdated thinking that contributed to the recession and their pain. Your message will be irrelevant to them. Do you want this for your park or your customers? Our backpacks are made with accountability in mind, we freely give information about our product testing results and are working to continually improve our backpacks. People are sensitive to price, but what they really want is a genuine experience and to feel safe. The recommended retail price printed on our price sheet is there for a reason. 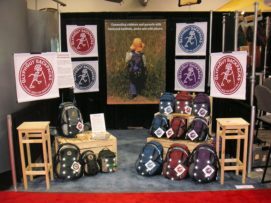 We understand how our backpacks sell and give pricing information to help you. If your store is selling a backpack higher than our recommended range it will be slow in selling. Bring the price back in line with suggested levels. You will still make a good profit. Cross-market with the Junior Ranger program at your park. 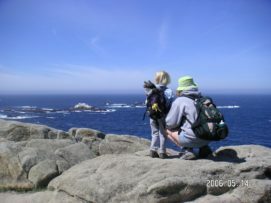 Offer parents/kids a discount on a backpack when they become Junior Rangers. Use some of the backpacks as an ‘adventure pack’ full of useful day hike items that a family can check out and use for the day. When they return the pack offers them a 15% to 25% discount off a brand new backpack. Create a display that features related items. Stuff a backpack as a sample so it can be tried on, tested, touched etc. Help the visitor to see how the backpack can be used and enjoyed. Customers will spend money when they see a value. Value is a combination of price, quality, and longevity. Our backpacks offer all three. Plus we can make it, deliver it, provide your store with pricing recommendations, merchandising suggestions and offer information to help your staff to be knowledgeable about our backpacks. The last step in creating value is at the store level. A genuine smile goes a long way. Being knowledgeable about products, answering questions, letting customers try on a backpack can help close any sale – even sales over $25. A suggestion, when working with the public in your store do NOT say, “Can I help you?” Eighty-percent of people will just say, “No thanks – just looking.” I do this when people ask me the question – others do it too. People dislike the question because 80% of the time the question is not relevant to their needs at that moment. Sell the backpacks for less, you make less per backpack but you will sell more backpacks. Bundle the backpack with other items to create a ready-to-go backpack with a magnifier, sketchbook, crayons, small book etc. In terms of costs, you might break even on one of the items, but you sell many more of the others. Offer a day-of discount on the backpack. If a child completes a Junior Ranger certification program they receive a big discount on a Junior Ranger backpack on that day. The copycat ‘Junior Ranger’ backpack is cheaper for a reason: it uses poor materials, low-quality seam work, is NOT compliant with U.S. product testing laws and is a blatant copy of GlyphGuy’s original backpack design. The copycat looks like a GlyphGuy Junior Ranger backpack but NOT in functionality, durability, product testing or originality. Remember, your park is what it sells to the public. We are always happy to hear when parks benefit from our products. Recently, we heard from an interpretive staff member at Pinnacle Mountain State Park in Arkansas where our backpacks are used in programming and in their store. 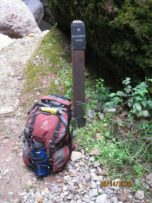 The park’s interpreters use GlyphGuy’s Coyote model backpack in their daily hikes and programs. The Bobcat model has been included as a ‘gift package’ for children participating in interpretive programs. These gift packages include a GlyphGuy Bobcat backpack packed full of items to help the kids explore the park. The packages are actually gifts from the child’s parents which are given to the children at the beginning of an outdoor program. Our backpacks are sold in the gift store. We have enjoyed Pinnacle Mountain’s return business for several years because our backpacks are solidly made, have sturdy zippers, include safety reflectors, and offer the gift store a good price point. 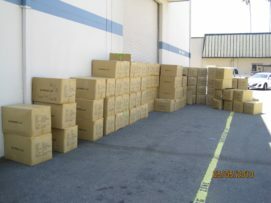 Unlike most vendors, GlyphGuy does not have a minimum order quantity. This allows the store to focus on their business – they can order what they need when they need it and do not need to worry about excess inventory. GlyphGuy Backpacks helps Pinnacle Mountain State Park to be more competitive. The park is adjacent to the city of Little Rock which includes several big name outdoor retail chains. Because of the proximity to these stores, the gift store must be selective in what it sells. Items that connect visitors to the park and generate revenue for the store are key to their continued success. We are happy that our backpacks enhance Pinnacle Mountain State Park’s ability to be competitive and further their interpretive work. 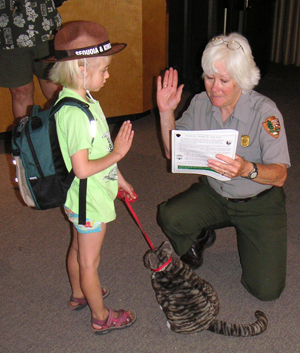 A new National Park Junior Ranger being sworn in; she is complete with her backpack and a (stuffed) cat that has joined her. This summer over 2,450 children will step into America’s National Parks with official NPS Junior Ranger backpacks. The backpacks were made by Mark Hougardy’s company, GlyphGuy LLC. Two models are available: the ‘Chipmunk’ backpack is designed for kids to 3 to 7; the ‘Coyote’ model is designed for kids 7 and up. These Green + Tan backpacks are embroidered with the ‘Explore. Learn. Protect’ Junior Ranger logo and serve the needs of park interpretive programs and cooperating associations. The backpacks are available at select National Parks and their cooperating associations coast-to-coast. For three years from 2005-2008 Mark Hougardy’s image of Mount St. Helens was used by the Northwest Interpretive Association to help fund visitor outreach and education services at Mount St. Helens, Washington. Discover Your Northwest (formerly Northwest Interpretive Association) promotes the discovery of Northwest public lands, enriches the experience of visitors, and encourages stewardship of these special places today and for generations to come. Copyright Mark Hougardy. A family enters the Visitors Center of a Park. Inside the building are the standard features: information counter, maps, interpretive displays, camping information, and a chalkboard scribbled with the latest trail and weather conditions. A small store area entices visitors with a colorful arrangement of park products that include: clothes, a Junior Ranger backpack, bug viewer, journal, compass, field guides, and a Junior Ranger activity book. The Dad notices a Coyote Junior Ranger backpack displayed on the wall. He takes a closer look. 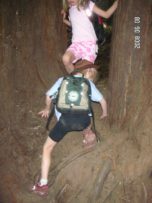 A sign on the backpack reads, ‘Try Me On.’ For a minute the Dad adjusts the pack over his shoulder; this middle-aged man looks silly trying on a Junior Ranger backpack but the kid in him cannot resist. 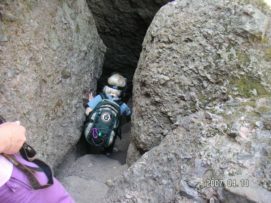 The young daughter approaches and picks up a smaller, Chipmunk Junior Ranger backpack. Dad had not seen this backpack on the shelf, but his daughter did. Close to the backpack samples were several baskets filled with flat backpacks ready for sale. Peppered around the baskets are child-sized binoculars, compasses, and items that complement the Junior Ranger program. The young girl tries on the smaller backpack. She twirls to show Dad then picks up a Junior Ranger activity book. She runs over to Mom. Dad studies his backpack: the stitching, the zippers even the embroidery. It was maybe a few dollars more than he wants to spend, but it is a solid backpack that will be used many times over. He reads the hangtag and is impressed that a backpack’s manufacturer donates a portion of the sale to the National Park Service. An eye-catching note on the wall mentions an ‘adventure pack’ program where families can borrow an outfitted backpack and aspiring Junior Rangers could use the equipment to help with their own explorations. The girl came back with Mom in tow. The daughter was ready to earn her Junior Ranger badge, maybe even get a Junior Ranger backpack. At the counter, the family chatted with the store employee for several minutes. The employee was very knowledgeable about the park and products in the store. The family enjoyed the day. 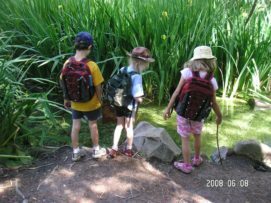 The information from the store employee, the good workmanship on the backpack and the Junior Ranger activities were combined to make the family’s time in the park relaxing, fun and relevant. Keep a stuffed backpack at your audience’s eye level. If your audience is 4 to 6; or 7 to 12 place items for their perspective. Need a refresher course? Stand on your knees and look at the items in your store. How do you see things? The number one missed opportunity in park stores is leaving a sample backpack flat! Ever seen a flat backpack? It is boring – the benefits are hard to see. Provide your customers with a sample Junior Ranger backpack that is plump. Find some brown Kraft paper, or recycle newspaper, and stuff a backpack with the crumpled paper. This plump backpack will be a what customer can pick up and squeeze, grip the texture, look at the materials, observe the workmanship, feel the weight, see it on another family member, even try it themselves. These things are hard to do with a flat backpack. A plump Junior Ranger backpack allows people to visualize how it can benefit them. What are the first things people see when they enter your store? Do you have a display that is inviting? Do the products differentiate your store from another store – or associate your park to a larger park system? Are the products in context with the park? Do the products benefit or detract from the park experience? Make the decision to ‘buy’ easier for the customer. Take away as many objections as you can by providing a physical sample and offering helpful information about the backpack. Create opportunities for people to see how a Junior Ranger backpack can benefit their time in the park – even their experiences after they leave the park. Should Junior Ranger backpacks be priced higher or lower than the suggested retail? Are you in business to make money, further an interpretive mission or do both? These can only be answered at your store level. But consider what other parks have done. A handful of parks have sold Junior Ranger backpacks at low retail to increase program participation. Some heavily visited parks sell the backpacks at suggested retail to maximize revenue. The majority of parks sell the backpacks slightly less than suggested retail. They make less profit per unit but sell more. How do you want visitors to see the Junior Ranger backpacks? As just another backpack, or as a tool to help youth explore and gain a better appreciation of the park. Help visitors see that the backpack can be an extension of his or her own explorations. Provide a sample with a bug-box, binoculars, viewers, field guides, journals, and any items that might be appropriate. 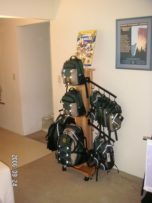 Do you have the ability or opportunity to link the backpacks into your Junior Ranger programming? Maybe the backpack becomes a reward item for completing a Junior Ranger activity. Possibly the backpacks are used as ‘discovery backpacks’ and loaned out to visitors to help them discover for themselves why your park is important. 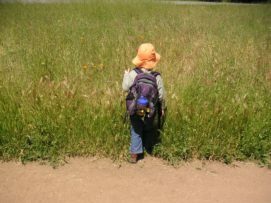 It is the larger Junior Ranger experience that should be marketed first; backpacks are a tool to help with the experience. 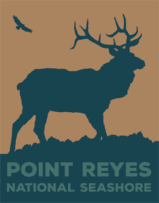 For eight years the Point Reyes National Seashore Association produced park stores items from Mark Hougardy’s Tule Elk image. An updated version of the image is shown. For thousands of years, vast numbers of tule elk thrived in the grasslands of central and coastal California. In the mid-1800s, following the gold rush, uncontrolled market hunting and rapid agricultural development nearly drove them to extinction. They were gone from the Point Reyes area by the 1860s. In 1874, the last surviving tule elk (possibly as few as two individuals) were discovered and protected in the southern San Joaquin Valley. Tule elk were reintroduced to Point Reyes National Seashore in 1978. Since then, the elk have grown from 10 animals to nearly 500. There are two separate herds of tule elk at Point Reyes, one in a reserve and one free-roaming herd. The reintroduction of this free-ranging herd is an important step in the ecological restoration in the park. Parks and outdoor interpretive organizations are always looking to green their operations. But sometimes the enthusiasm of the moment results in a “Ready, Fire!, Aim” approach that has unexpected consequences. Please use the following “Ready, Aim, Fire!” framework to generate additional discussion at your own location. First, understand the purpose of greening your enterprise (Ready). What problem do you wish to solve? This may sound counter-intuitive, but the purpose of greening your space is not about ‘saving the planet’ or ‘protecting the environment’. While individuals and organizations may be passionate about such issues, framing a discussion around these overmarketed hot-button slogans could have combustible results. Remember that a manager, co-worker, budget officer, a visitor, even a financial donor may have a very different perception about these words and their meanings. The purpose of greening your organization should instead be grounded in measurable benefits like reducing waste, reusing-recycling materials and conserving energy. Any green activity must make sense financially. – Obtain the marketing high ground. – Gain a competitive advantage. Obtain the marketing high-ground: By reducing waste, reusing-recycling materials and conserving energy you can market yourself as a good neighbor and a positive influence in the community. Good neighbors are hard to find. Good neighbors have value. Gain a competitive advantage: You want to provide a potential visitor less of a reason to say ‘no’ about visiting your location. By demonstrating a healthy and clean place for families to visit and spend quality time you gain an advantage over competitors (competitors include anything that will distract a possible visitor from spending time at your site). A healthier bottom line: If you measure the results of your green processes (reducing waste, reusing-recycling materials and conserving energy), review and make adjustments along the way, the long-term effect will be a healthier bottom line for your organization. Document your project’s scope – this includes the project’s purpose and business justification. Imagine that you will sit down with a hard-nosed decision maker – you only have two minutes to answer their question, “Why should I care about this?” Open up a blank PowerPoint presentation and start typing; in 5-7 slides, no more than 10 you can make an executive level presentation – short, quick, to the point. Even if you never use this document in a presentation, you understand (and can communicate) the scope of the project. The purpose of an assessment is to help establish a baseline for your green practices. A baseline is an original plan for a project, and any changes will be measured against the baseline. Here are two green business frameworks to help with your assessment. These frameworks were developed by the Santa Clara County – Bay Area Green Business Program (please look these up online for the latest versions). Please note the Bay Area Green Business Program can only certify businesses and organizations within their territory (San Francisco Bay Area in California). Possibly the need exists for a national certification especially for interpretive centers and related organizations (hint). This is an entire subject by itself of which future articles will be written. But here are some key points to remember when implementing your green processes. » Build on small victories. » Generate momentum (buy-in) for your project by demonstrating the economic benefits. » Green activities should not be dictated from above – rather modeled. » Don’t clutter up people’s lives with inconvenient solutions to small problems. Publish the processes on an intranet or another centralized internal website. Communicate with your donors and visitors about how you are reducing pollution, etc. Educate any front line staff to the advantages and goals of your project. Refer to your original baseline and track progress at least on a monthly basis. When greening your own operation remember a “Ready, Aim, Fire!” approach before starting a project. Understanding the purpose and the justification of the project will help you in reaching your green goals. Elephant Seals are large, blubbery creatures with elephantine-like noses. Adult males can grow up to 13 feet in length! The seals were once hunted for their oily fat which was used in oil lamps in the 1800s. The demand for their blubber was so intense that their population plummeted and they were thought extinct. Fortunately, a small population survived on an island off the coast of Mexico and over time their population has returned to California. 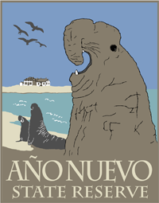 Año Nuevo State Reserve offers a special opportunity to see these creatures up close and in their natural habitat. The image will be used in the visitor center to help generate revenue for visitor engagement and interpretive programs. Copyright Mark Hougardy. The Pigeon Point Light Station State Historic Park is a feast for the eyes. This landscape is a synergy of nature and an elegantly engineered human-made structure. The 115-foot light station was built in 1871 on this prominent section of the coastline to warn ships of dangerous waters. Today, visitors can enjoy the beautiful setting and whale watch. Mark Hougardy’s design will be used on park store items. Revenue from these sales will be used to help fund park visitor and outreach services. Copyright Mark Hougardy. Big Basin Redwoods State Park is California’s first and oldest state park. On June 8, 2002, they kicked off 100 days of celebration that include festivities, hikes, speakers, and interpretive events. Actor Clint Eastwood, who is a newly appointed state park commissioner, gave opening remarks. Mark Hougardy created the poster representing the Centennial. The family seen in the image was modeled after his family; the child is his daughter, she is two years old. It is Mark’s hope that she will witness the park’s Bicentennial. She will be given a copy of the poster signed by celebrities and dignitaries who attended. The trees visualized in the image are just north of the main building and can be easily seen from the single-track road #236. The poster is very simple in design and the first such project of hopefully more to come. Patches, pins, and postcards will be created with a modified image and used to help fund park outreach and interpretive services. Big Basin consists of more than 18,000 acres of forests, chaparral, and riparian habitats. 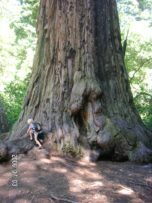 It is also home to the largest continuous stand of ancient coast redwoods south of San Francisco. Visitors can enjoy over 80 miles of hiking, biking, and equestrian trails; 181 car camping sites; tent cabins; backpacking camps; and a visitor center.